Watch the Sept. 26 committee discussion and staff presentation and read the Q&A. Watch the Oct. 10 board meeting. Read the General Manager's H2outlook blogs "California WaterFix: History's Winding Road to 'Yes' " and "California WaterFix: How a Big Project Looks Smaller." What is the Timeline for California WaterFix? Who Would Pay for California WaterFix? Metropolitan Board Chairman Randy Record and Sanitation Districts of Los Angeles County Chief Engineer and General Manager Grace Hyde turn on the faucets. Metropolitan took a big step toward local water sustainability when it broke ground on the Regional Recycled Water demonstration facility in Carson. MWD directors, local, state and federal elected officials, community leaders and representatives from environmental groups gathered for the event. The Advanced Purification Center is a joint venture of Metropolitan and the Sanitation Districts of Los Angeles County. Once built, it is expected to operate for about a year and produce data needed to consider a full-scale project that could become the nation’s largest water recycling plant. View the new recycled project website, watch a video explaining the project, and view a video recap of the event. Metropolitan General Manager Jeffrey Kightlinger issued a statement regarding the California Supreme Court decision to deny the San Diego County Water Authority’s petition for review of the state Court of Appeal’s decision on litigation challenging Metropolitan’s water transportation rates. Read more. International Boundary and Water Commissioner for Mexico, Roberto Salmon, left, and International Boundary and Water Commissioner for the U.S., Edward Drusina, right, sign the agreement. Metropolitan isn’t just a leader when it comes to Southern California water issues. It also played a leading role in negotiating an historic agreement between the United States and Mexico to manage shared Colorado River resources. The new agreement provides additional funding for water efficiency projects in Mexico and some of the conserved water could be used by U.S. funding agencies. Mexico has also committed to voluntary reductions in water use when Lake Mead hits specified low elevation targets. Some of this newly-conserved water would keep Lake Mead levels higher and provide improved environmental flows in the Colorado River Delta that will benefit species and habitat. Metropolian’s board approved the plan at its September meeting and the binational agreement was finalized two weeks later. The new redesigned bewaterwise.com web page makes finding the large universe of water-saving rebates easier than ever to find. From residential indoor and outdoor water conservation tools and devices to those for business and industry, the bewaterwise.com rebates page is the one-stop place to find the many ways to save water while saving money too. Metropolitan has many tips and resources at bewaterwise.com to help you save water in your yard. Garden videos also help you visualize how your yard could look by showing various beautiful water-saving plants and what they look like in a garden. View our October video. Metropolitan's Water-Saving Outreach Campaign Goes "Spectacular"
The latest phase of Metropolitan’s ongoing Love Letters water conservation campaign includes the installation of two "Spectaculars." These are oversized billboards that extend beyond the edges of a traditional billboard to attract attention. The eye-catching spectaculars show a beautiful butterfly thanking Southern Californians for saving water "for the birds and the bees and me." The billboards are located on the northbound Long Beach/710 freeway near Firestone Boulevard and in San Diego along the westbound 8 Freeway near the Fairmount Avenue exit. Read more about the campaign in Los Angeles magazine. Above, Metropolitan's Water Efficiency Manager Bill McDonnell, right, accepts the award from Associate Director of the Water Infrastructure Division in the Office of Wastewater Management Leo Gueriguian. The U.S. EPA recently awarded Metropolitan with the 2017 WaterSense Excellence Award for its comprehensive program of incentives and rebates to advance conservation and promote WaterSense labeled products throughout its service area. Read more. From left, Metropolitan Board Chairman Randy Record, Pechanga Band of Luiseño Indians Tribal Chairman Mark Macarro, and Eastern Municipal Water District General Manager Paul Jones sign the agreement. On Wednesday, the Pechanga Band of Luiseño Indians, Rancho California Water District, Eastern Municipal Water District, and Metropolitan signed a historic agreement enabling the Tribe to augment its local supply of water, as confirmed through the Pechanga Water Settlement Agreement. 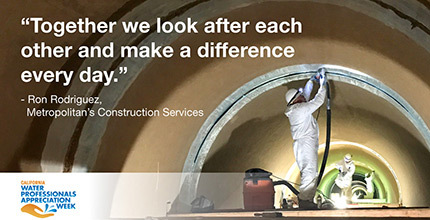 Watch our updated video on progress made on the Lake Oroville spillway. While recently doing field survey work involving the Rialto Feeder near Fontana, Metropolitan Field Survey Team surveyors Mike Starr and Nick Ellis happened upon a rabbit trapped in a small vent pipe several feet below ground. Using equipment on hand – a level and level rod – Mike wedged the rabbit and carefully brought him up to the surface and freedom. Said Mike: “It made our day when he hopped away into the desert.” View a video from that day. Radiologist Barry D. Pressman was seated on Tuesday as the city of Beverly Hills' representative on Metropolitan's board of directors. 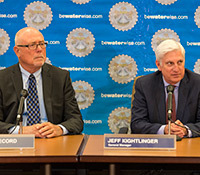 Pressman replaces Robert Wunderlich, who had served on the board since July 2007. Read press release. Metropolitan is participating in many events in October to educate the public on the value of our projects, services, water systems and conservation programs. 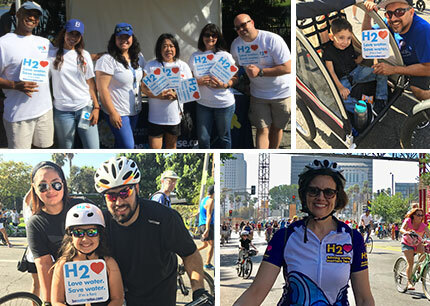 Recently, Metropolitan participated in CicLAvia's heart of downtown Los Angeles annual event. California’s first-ever Water Professionals Appreciation Week launched Oct. 7 as part of a new annual designation to highlight the important role of water industry professionals and local public water agencies in ensuring safe and reliable water, wastewater, and recycled water in our state. Metropolitan celebrated employees during the week and will continue to through the end of the month. Read more.